Forty years ago, Randall Jarrell sadly proclaimed that the gods who had taken away the poet’s readers had replaced them with students. These days, the students have disappeared as well, and been replaced by prizes. There are now over 50 first-book poetry contests in the United States. (The wag might say: a number equaling the average readership of the first book of verse). Why are there so many poetry contests if no one is reading the stuff? The answer is simple. Our poetry publishers need all of these contests and prizes so that they can extract reading fees from the only readers they have left: aspiring poets. It’s a captive audience, and they have to pay up. How else will those hordes of MFA graduates, poetasters, and assorted non-entities ever shine at AWP if they’re not in print? This has bred a fatal indifference among many of our poetry presses, since they don’t survive on selling books anymore. They survive on running contests. The Po-Biz is simply a Ponzi scheme. I had hyacinth on my mouth. to be asked to speak. This is not the opening stanza, it’s the entire poem. The reader might ask: Who has hyacinth on the mouth? (and shouldn’t it be in the mouth?) How can a city think? Or arrive with photographs? Where does the city arrive? To whom does it wish to speak? To the bird? What would the city say if it could speak? These basic questions sound ridiculous, and are rather absurd: like putting riddles to the Sphinx and expecting answers. After all, the monster was there to devour the innocent traveler, not provide directions; and Hughey’s poetry likewise haunts the gates of meaning. Who spent the night for church the next day. to Kathy. The heart from homestead. The map to go too far. Says Sunday house. Says womanly opposite. Says glass armchair. I’d like to cover the whole thing with rhinestone. background is reflected in the silver. Make the bed as Victorian as a stack of soap. Brick house adding fragrance to the mint. I cannot speak.–But shrug brass cruelly what is thine? If I told you that, for the sake of comparison, I have included the title poem of Hughey’s collection along with a recent spam email (that I have altered only with line-breaks) would you be able to tell the difference? Would you believe that between Elizabeth Hughey and—to quote from a Wikipedia entry on the probable origin of such “discordant poetry” spam—“a script kiddie ineptly running a spam suite” there appears to be great aesthetic kinship? (Actually, I prefer the malfunctioning software: its mix of demotic phrasing and Elizabethan tones— cruelly what is thine?—has created a more interesting poem). Is Hughey’s poetry a parody of spam or an homage? Who can know or tell? Beyond here, the reader cannot go: parody becomes impossible in the midst of such self-parody. 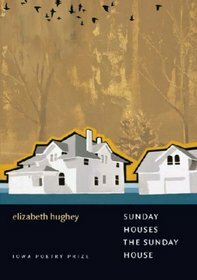 I wish it were true that Hughey was simply that lone figure, the particularly bad poet, to whom one might feel condescension or affectionate pity but she’s merely one of a host of young American poets engaged in what the critic Joan Houlihan has called the “post-dementia” school of writing. Need it be said that this movement has its own literary magazines, MFA programs, and prizes? There is nothing in American culture too silly for someone to practice or teach: and I suppose that if we are tolerant of the banalities of our professors and politicians then we should be equally so of our incoherent poets. Still, I am not so sure. The problem with banality is that it’s merely the pleasant face of hardened indifference. To have an audience, you must care about a reader: that statistical non-entity who must purchase your book, read your poems, and be moved enough to remember or even memorize a line or two. So much contemporary poetry seems written for the void, for no one at all— like spam email, it is merely sent out by publishers conditioned to shrug at the public’s indifference. The audience for our good poets is so small that it’s easy enough to supply it with the not-so-good, or even the self-evidently awful, since the mediocre and the majestic sell the same number of books. The University of Iowa Press has not done the reading public any favors by publishing this travesty and calling it poetry; but then I remember that there never was a reading public for this book other than its author, or a press that cared about more than its contest.